Here’s some interesting information I happened upon at the Guest House Museum today. 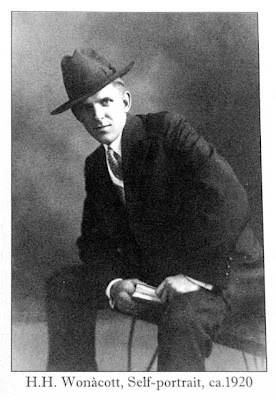 "Harold Howard Wonacott was born in Missouri in 1888. His family moved to Oakland in 1903 where he apprenticed with a photo studio. In San Francisco he photographed the 1906 earthquake. One story says he ferried to the stricken city from Oakland, made photographs and returned to his studio in Oakland at night to make prints. He then sold the prints on the street for a dollar each, reputedly making a healthy profit. 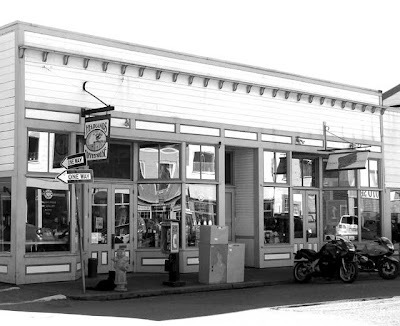 "In 1908 H.H moved to Willits where some of his relatives were living and opened a studio at Valley and Main Streets. By 1911 he was doing well enough to marry and in 1917 opened a second studio in Fort Bragg. He continued to work in Willits a couple of days a week until John Parkins bought that studio in 1922. From then on he resided on the coast. Large photo commissions by the Union Lumber Company to document their reforestation project and mill operations may have made this move possible. "Other photographic work included portraits of individuals or groups, school classes and local businesses. In addition he photographed events, festivals and everyday scenes of interest which today offer a window into our area’s past. He also provided film processing for customers through larger drug stores. He offered prints for sale at his studio on Laurel Street. 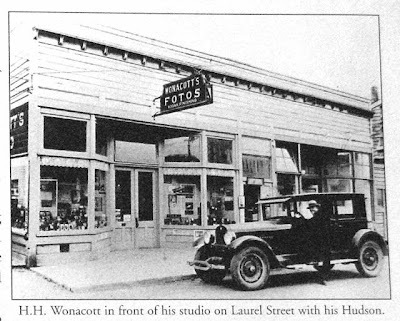 "Automobiles were an important part of Wonacott’s photography business. In Willits he advertised a Thomas Flyer as a prop for portraits that he made into postcards. After 1917 the car he drove between the Coast and Willits advertised his services on the spare tire and side doors. " In this image of his studio in Fort Bragg he is standing with his prize Hudson parked in front. Even after he no longer drove it he kept the Hudson in the barn to remind him of the old days. "Wonacott sold his studio in 1947 to Gerhardt Ahl from Wisconsin and retired to his farm off Simpson Lane (south of town) where he had a trout farm called, “U-Catch-em” He also had a small studio there which he used to take photos of happy fishermen with their trout catch. Wonacott happily operated his farm and trout farm until he died in May of 1960. "Meanwhile, Gerhardt Ahl dumped most of Wonacott’s negatives over the bluff, probably at the City Dump (Glass Beach), and sold his panoramic camera. He had no appreciation for their historic value. "In 1948 Hal Ogle, who had come to Fort Bragg in 1945, took over Wonacott’s Laurel Street Studio. He gave many of the surviving negatives to a local history buff named Albertson. Ogle continued at that location until 1968 when he moved to a new studio on McPherson Street. Love your web site. H.H. Wonacott was my great grandfather. I hope to come up to Fort Bragg soon and see any of the photos that might be in museum.